so you cannot be blow away into the open sea. Djerba has ideal conditions of wind and weather. Learning catamaran sailing has never been that easy. 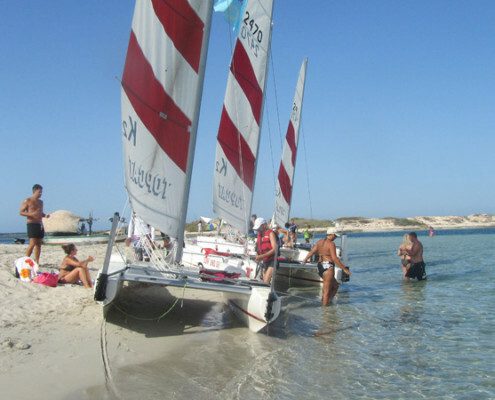 On Djerba you will find one of the best places for watersports around the Mediterranean Sea. Best wind conditions all year long will pump you up! On Djerba Island the wind conditions are great, 3 to 5 Bft. on regular basis makes Djerba an excellent spot for all watersports. The Kitesurfing School is located on the South-East coast of the island. It’s an incredible lagoon of 40 Square KM with flat and shallow water. You will learn this sport very quickly without risk. VDS-, VDWS-, IKO Kiteschool with English-, French-, German- and Italian-speaking teachers. Our pupils are aged between 9 and 70 years. They have learned kite surfing quickly and safely. The number of people, who come to Djerba in order to learn kitesurfing increases year after year and countless people have learned kitesurfing in our school. Some of our teachers are already working with us since the founding of the school. So they have a lot of experience. The wind conditions on Djerba are excellent. Ideal wind and weather conditions offer you the best conditions. Sailing with the wind in your hand, which is still surfing. Winds at 4 knots. guarantee you a fast and flat water learning – The focus of the course is practical – so from the beginning on you experience the direct contact with the elements of wind and water. The Sport Catamaran is a sports equipment which demands fast reactions and skill. The rapid speeds which are already achieved in light winds and some other maneuvering require specific knowledge and skills. You are looking for a challenge? Then dabble in our events! The Kiteweek is the most intensive way to learn kitesurfing. In 3 days of training and 3 days of intensive training you learn kitesurfing gradually in all important elements. 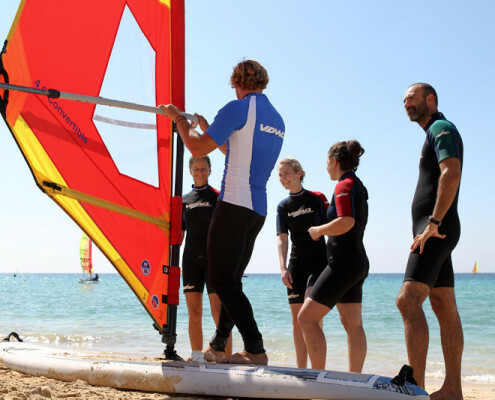 There are twice a year and organizes Schulung- Catamaran Regatta training together with the sailing school Mövenstein in Hotel Calimera or Hotel Diana Rimel. Dream area for beginners who want learn kitesurfing! I’ve seen anywhere else so good trainers, who provide their students with the appropriate material and have the necessary knowledge and skills! I I have done two lessons before on Fuerteventura and in Egypt, and regret that I did not first come to Djerba. All ,who are already advanced kiters and might want to practice the one or the another trick find here a super big and safe training area. After 14 days, I am convinced of the lagoon and the school, so that this was not my last vacation on Djerba !! Here at the kitespot I have met just super nice and relaxed people and I hope that this will continue!